I watched this one because I was encouraged to do so by a great review written by Tasha/Heidenkind on her blog. I strongly recommend you visit her place and read it as well. Thanks, mon amie! Nocturnal underbelly of Los Angeles. Lou Bloom (Jake Gyllenhaal), a petty thief but also an intelligent man desperate for work and keen on self-improvement, muscles into the world of crime journalism and soon enough he blurs the line between observer and participant. As you watch Lou navigating the cut-throat, dangerous realm of nightcrawling after a while you come to think such a line never existed for him at all. He steals a posh bike, sells it, buys a cheap camcorder and a radio to listen to the police frequencies, and soon enough he is filming crashes, fires, road accidents and murders, the bloodier the better. Each police siren equals for him not a tragedy but a possible windfall and a scoop. He wants to be a perfect professional and sell his material; everything else is of secondary importance. Aiding him in his effort is Nina, a TV-news veteran (Renee Russo) equally desperate to improve her lackluster career in one of smaller national TV stations. She knows everything there is to know about what American audience want to watch. They understand each other perfectly but it doesn’t mean they can trust each other. Will Lou manage to become the star of his own story? What price tag is he willing to accept? After watching this one I was left speechless. I mean it very literally – I couldn’t and I didn’t want to talk. The movie was very good but its topic was something intelligent horrors should be made of. I’ve seen it called a pulse-pounding thriller. I happen to disagree – for me it was rather a horror. One thing is sure: Jake Gyllenhaal, an actor you might associate with ‘Brokeback Mountain’, is an incredible professional, completely able to play whatever is thrown his way. Yes, his physique might remind you of the cowboy from ‘Toy Story’ but don’t let these big eyes, goofy smile and thin face fool you – he is anything but cartoonish. Lou as played by him can be called a psychopath – he notices other human beings only if and only when they serve his goals. He can interact with them, he might even occasionally try to be charming and funny, but it’s just a front hiding a very selfish, very ugly personality. At first I wanted to use many animal names in my description of that particular character – hyenas, vultures, Komodo dragons, crocodiles and sharks crossed my mind – but then I thought that such a comparison would be doing those animals a huge disservice. After all they do only what their instincts force them to do and in their ecosystems they serve an important purpose; also contrary to people they don’t have any conscience or free choice. So let me leave the animal kingdom in peace and put it another way: if Lou were living during the WWII and was a German man he would be one of the scariest, the most ruthless and brutal Nazis around, most probably working at one of their death camps and being proud of his efficiency and professionalism. Of course he would have never blamed himself for any death or atrocity afterwards. Lou’s treatment of his young ‘intern’ is a perfect example of that attitude. “I run a successful TV news business,” he says to Rick (Riz Ahmed), a simple, desperate boy whom he hires as a chauffeur, a second cameraman and a living navigation aid; later SPOILER, highlight to read or skip he lures Rick to his death and leaves bleeding on the street after recording his last moments because Rick dared oppose his decision. Mind you Gyllenhaal wipes every fleck of irony from his voice as he makes that announcement, and you can see why. To him, feeding on carrion is not a sickness, or an outrage; it’s just perfectly understandable corporate practice – as long as you are paid and you don’t get caught everything is ok. In his own mind Lou is an entrepreneur in the finest American tradition, a man who wants to pull himself by his bootstraps, no matter whether he steals fences, bikes and manholes or chases police cars and ambulances. The idea that his work might be perceived as invasive, legally questionable and morally wrong never troubles him. In fact, it never occurs neither to him nor to Nina. In their world the idea of respect is about as silly and obsolete as a sword fight in times of nuclear bombs; there is only people’s appetite for cheap sensation and money it provides. Viewer discretion is a joke because if you let people’s attention drift, refusing to show the bloody morsels in their best interests, they will turn away or change the channel and you’ll be left jobless soon afterwards – that’s what Nina and Lou would call a truly scary scenario. 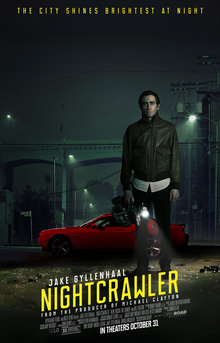 This entry was posted in contemporary thriller/horror, movie review, one great movie and tagged anti-hero, dan gilroy, horror, Jake Gyllenhaal, movie review, news hunters, nightcrawler. Bookmark the permalink. This is definitely one of the better movies I’ve seen recently! I’m so glad Gyllenhaal is receiving recognition for his performance. Completely agreed – on both counts. The movie is not only shot incredibly well but it also deals with an important topic. What’s more Gyllenhaal and Russo share incredible chemistry on the screen and I have to say it was a kind of surprise for me personally. It is definitely worth watching but you might start liking Gyllenhaal a bit less – he is a tremendous baddie. oooooo, that usually makes me like them more (its easy to be a goodie, but being a baddie takes skill). It seems you are a woman after my own heart – playing a baddie takes a greater skill indeed! You pretty much listed every reason for me NOT to watch this film. Pity. I still think it is a good movie.